CAPE CANAVERAL, Fla. —The new spaceflight technology behind NASA's new deep-space capsule could one day take astronauts to Mars, space agency officials say. 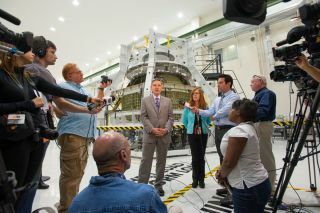 NASA showcased its new deep-space exploration technology in a recent tour at its Kennedy Space Center spaceport here Florida to present the first prototype of the Orion Multi-Purpose Crew Vehicle (MPCV). This capsule is due to launch on its maiden test flight in 2014, paving the way for flights in the future that could take astronauts back to the moon, and on to asteroids and Mars. "Orion is critical to our future," Robert Cabana, director of the Kennedy Space Center and a former space shuttle astronaut said during the Jan. 30. NASA has been charged with sending humans farther out into the solar system than ever before, and "this is our vehicle that's going to do that," he said. The height will allow the mission to test a high-speed re-entry through Earth's atmosphere, equivalent to what astronauts returning from the moon or deep space would incur upon their return. The capsule will reach a peak speed of some 20,000 mph (3,200 km/h) as it falls toward the atmosphere and begins its fiery 2,000-degree-Fahrenheit (1,100 degrees Celsius) plunge home. The first manned Orion mission could come as soon as 2021. But Orion isn't the only element of new technology necessary for manned excursions into the solar system. In a building across the street from where Orion is housed, where Apollo astronauts once trained for their moonwalks on a lunarlike surface, future concepts that could aid moon- and Mars-bound missions are being tested as part of a new program known as Swamp Works. With a name playing on the Skunk Works program from which Lockheed Martin designed the U-2 aircraft and stealth fighters, the Swamp Works program is building on lessons learned during Apollo. Where astronauts who walked on the moon encountered issues with dust interfering with equipment and space suits, NASA is now designing materials to prevent the gritty lunar dirt from causing problems. Using built-in electrodes, one such material could keep the dust off by sending a small electric current through a coil built into an astronaut’s space suit, a camera lens or other equipment future astronauts may use on the moon or Mars. A new lunar rover known as RESOLVE (for Regolith and Environment Science and Oxygen and Lunar Volatile Extraction), which NASA and the Canadian Space Agency hope to send to the moon later this decade, was recently tested on lava beds in Hawaii. The beds are similar to the makeup and terrain of the moon's surface. Another roverlike design is aimed at low-gravity testing methods for digging into hard planetary material, called regolith, and even ice, with ease using counter-rotating buckets to excavate the surface. Samples of such regolith, which may be rich with hydrogen and oxygen, could then be analyzed and potentially have their resources extracted and consumed by astronauts. Another test looked into the use of surface regolith to create an ablative (burn-away) heat shield for a return to Earth. If humans are ever to live for long periods on the surface of another world, living off the land could be the way to go. And the designs those astronauts use in the future may originate in this laboratory at the Kennedy Space Center. Extracting resources "is the key to expanding civilization in space," said Jack Fox, the chief of NASA's Surface Systems Office, which looks into the technology and methods to be utilized on the surfaces of those other bodies.